Last month I posted a chart of the progressive year-to-date global average surface temperature, from GISS. This is the update with April included. I'll repeat the explanation with each update and add what seem to be things to watch. April was an average of 0.75°C above the 1951-1980 mean. From and including December 2014, every month has been the second hottest in the record for that month, except for March 2015, which was the 3rd hottest March on record. Every month this year has been at least 0.75°C above the 1951-1980 mean. The progressive year to date average up to and including April is 0.79°C above the 1951-1980 mean. 2015 is still ahead of the pack so far. The years to watch are 2014, 2010 and 2005. I've plotted them with slightly thicker lines so they stand out more easily. Anthony and Roy are touting the cool April. You can see that even if the plots for GISTEMP and UAH are aligned to the same baseline period (1981 - 2010), UAH is still running on average ~ 0.2C colder that GISTEMP (if you look at the difference during periods of relative ENSO stasis, that is. Because during extreme El Niñ0/La Niña events, the satellite records are all over the shop). Then if you look at the plot above that with the original, skewed baseline periods, you can see that UAH is running on average about 0.5C colder than GISTEMP there. Question for Roy: why is it 0.2C colder? Sorry, correction to above: only during El Niño events are the satellite anomalies abnormally high . In any case, as tamino likes to say, "It's the trend, stupid". 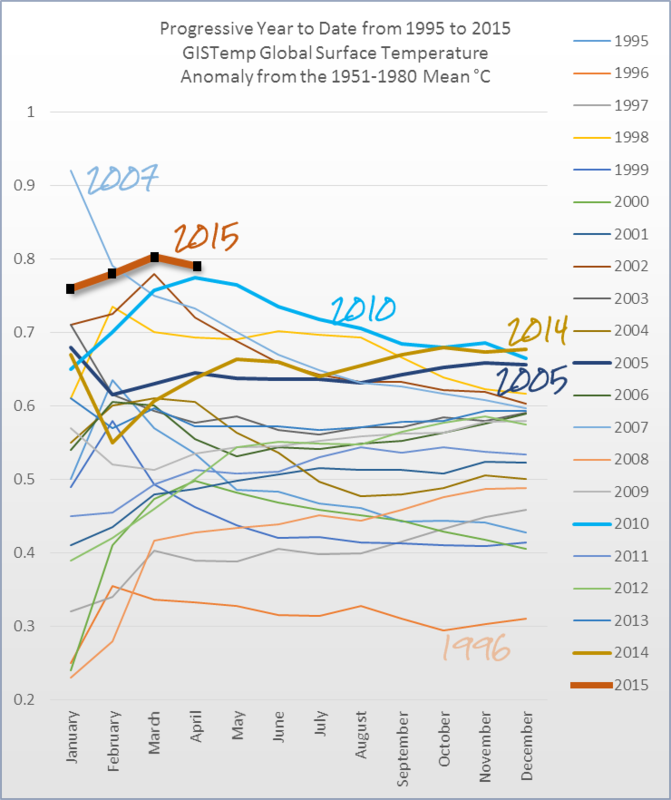 What really matters is that the trend of all the records is roughly the same (up until recently when the satellite records started to diverge), no matter what the baseline period. And that's the only thing that really matters in the end. Here is a chart of annuals for RSS and UAH v6beta lower troposphere, and GISTemp surface - since 1979. Sou, you said that April 2015 was an average of 0.75°C above the 1951-1980 mean but my eyeball perceives it as closer to 0.79°C above the mean. Perhaps I need new spectacles? Whether 0.79°C or 0.75°C, it's still an alarming surge. As I noted in the previous instalment in this series the back end of the year needs to be spectacularly cool even to bring 2015 to just scraping over 2014 as the warmest year on record, and this in the face of a rumbling El Niño. One could argue that this is just another blip like 1998, but if so they're coming closer together and with unabated enthusiasm, and with the underlying cause being completely unaddressed to date and for the foreseeable future, the prospects for the biosphere look grim indeed. No worries, it's the same trap as last time - you plotted the running average!